He raised his hand high to wag a finger under Shaxx’s nose. Two children ran by in a blur, laughing. The Titan stared down at the Hunter, but said nothing, his hands clenched in fists. Cayde ignored the posturing and turned to face a desolate field of dirt and large rocks. A writhing mob of children spread across it, clusters of them barreling into each other as they bellowed and screamed. A much smaller number of elders waded in the chaotic sea of miniature people. “What is this? What’s happening?” Shaxx demanded. “So. You’re going to pick two,” Cayde said. “This is ridiculous,” he concluded. A child sped past and waved at Cayde as Shaxx spoke. Cayde responded with an upward thumb. Beneath the helmet, Shaxx stared holes into the Exo’s face. “You wouldn’t dare,” Shaxx began, but Cayde was already lost in a departing crowd of adults. Shaxx let out a breath, then scanned the field again, past child after squirming child. He quickly discerned the two on the field with the best athletic potential. Two human girls, snarling as they swung branches at each other, seemingly impervious to pain. He walked past them, through the crowd, and several elders paused just briefly enough in their youth wrangling to let their jaws hang. Lord Shaxx navigated the unruly sea with grace, and headed toward a lone tree in a corner of the field. An Awoken girl and a human boy sat huddled below it. As Shaxx’s shadow eclipsed them, they looked up at him with the same brightness in their eyes. “What are your names?” he demanded. “Runa,” said the Awoken with some disdain. She returned the blank stare of Shaxx’s faceplate. “My name is Lonwabo,” recited the human, more like a question than a statement. “You look bored, Runa,” Shaxx observed. “And you look worried, Lonwabo.” He pointed at the boy, who scooted back, startled. They both spoke at once, and Shaxx listened in silence as they talked over each other to explain the game: Teams of two launch orb projectiles at each other, and players struck are eliminated. If both players on a team are eliminated, the team is out of the tournament, and their chance to play on the field is over. “What do you call this drill? Skirmish? Supremacy?” Shaxx demanded. Shaxx waved one of the adults over. “Lord—Lord Shaxx?” said the Exo male. Lonwabo opened his mouth as if to speak, but hiccupped instead. Shaxx turned them both around to face the sun and the other team across the field. He kneeled so low that his face was level with theirs. The three stared at the opposition: two human boys, eyes glaring, fists balled in determination. 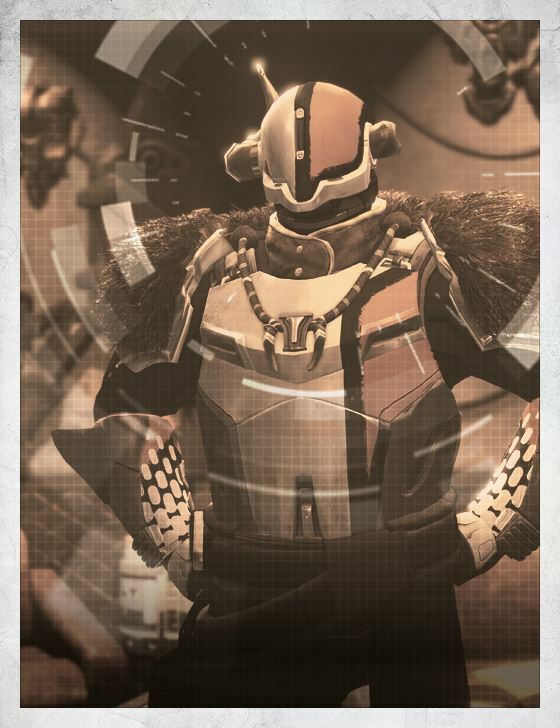 Their elder stood behind them, her eyes wide as she recognized Lord Shaxx. Runa yawned and rubbed her face, trying to clear the sleep from it.